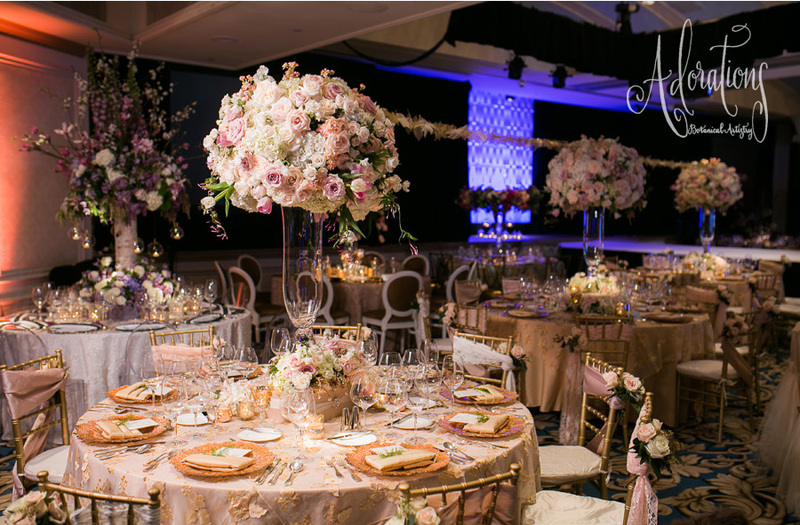 A few Sundays ago, the US GRANT Hotel showcased their annual Luxury Wedding Show and Luncheon for brides-to-be to experience four ballrooms brimming with styled vignettes from Southern California’s elite wedding specialists. Adorations was so honored to create SEVEN of these amazing décor setups. And yes, you did hear right. SEVEN. We think that’s a lucky number. It all began when Thomas Bui Lifestyles and Wynn Austin Events asked me to work with them on tabletop designs for the Grand Ballroom, which would be where the Luncheon and M Bride Couture Fashion Show would be held. I so adore working with both Thomas and Wynn that I said YES. When the US Grant also asked us to style Palm Court as well – you can guess it – I said YES as well. While that may sound like three vignettes, both Thomas and Wynn were responsible for three tables EACH! 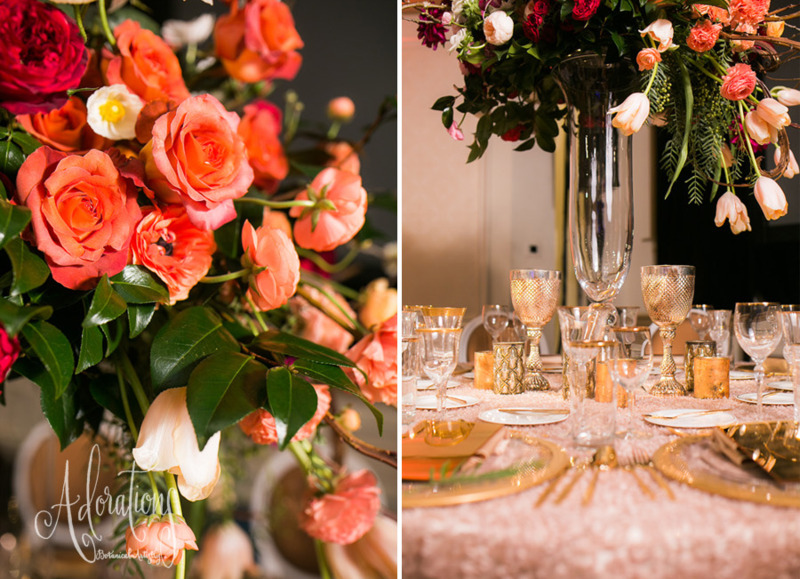 Upon meeting with both of them to discuss the designs, Thomas decided to go for three completely unique tabletops while Wynn wanted to connect hers quite literally with a gorgeous ribbon of translucent gold magnolia leaves draped from each high centerpiece. Her lovely color palette of blush, cream and gold, which remains to be many bride-to-be’s favorite, was luxury at its finest with garden White O’ Hara roses, palest blush Quicksand roses, with pieres japonica and trailing jasmine vine woven throughout. Thomas was thankfully placed right beside Wynn, front and center of the stage, with his three tables. My team joked a bit that the space in-between the two rows of tabletops was the “Adoration’s Alley” since we all had worked so hard to make these grand floral pieces for such a luxury show. Thomas’s first tabletop design was “The Blossoming Tree,” fairytale in style, with floral groupings seeming to grow organically out of the base of a true birch trunk. The tree was blossoming with purple lilac, lavender sweet pea and purple clematis with rising white and lavender hydrangea, camellia leaves, sweet peas and roses in various stages of bloom. White and lavender clematis weaved ethereally throughout while the crown of the tree trunk featured branches of white cherry blossoms and blooming magnolia. The “Marsala Masculinity” was Thomas’s 2nd tabletop that we took a modern yet whimsical approach to highlight the Pantone color of the year with several shades of sultry red, bronzed copper and pops of peach. The crescent-shaped centerpiece cascaded with French tulips tight clusters of Tess and Piano garden roses, deep red amaryllis, coffee break roses in a copper hue, red and peach ranunculus, Juliet roses, and dark spray roses were infused with anemones, poppies and dahlias. The design was made complete with mercury votives in a distinctive regal pattern, gold chalices, golden charger plates, rich linens and floating candles for a debonair styling. “The Golden Halo” was the third in our series with Thomas, rising 4 ft above the tabletop with a golden halo ring atop a vessel of vibrant blooms. As one looked up, they saw the flowers reflecting through glass globes in this artfully designed installation. The dramatic yet romantic ring grew in size from 36 to 48 inches in diameter with the lush display of fleurs, featuring the famous David Austen roses, Juliet garden roses, Phoebe roses, clematis, hellebore with antique green hydrangea suspended with pepper berries and dripping with jasmine vine and purple clematis creating a visually stunning art piece. Our final installation was in the Palm Court, right off the lobby at the US Grant that boasts a grand piano in the very center of the room. We wanted to highlight not only the stunning musical instrument, but also the musician himself. As one entered the room the piano was set in a floral frame with bunches of mono-floral bouquets angled with movement to direct the eye towards the piano. We set a vibrant centerpiece on the piano tall with blooming magnolia blossom branches, antique hydrangea, purple lilac and cascading purple phalaenopsis orchids, reminiscent of the floral groupings from our poised bouquets. It was such a stunning visual impact as quests entered into this beautiful space at the US Grant Hotel. I’d love to give such a special thanks to my entire TEAM at Adorations Botanical Artistry. We not only had an actual wedding that weekend but worked around the clock to make these show installations so over-the-top! THANK YOU from the bottom of my heart!! And of course to the US Grant, Thomas Bui and Wynn Austin – we are truly blessed to not only work with the very best wedding professionals, but also consider you friends! Thank you for all that you do for Adorations Botanical Artistry! We look forward to many more grand events! Thank you! Have a fragrant day! Adorations Botanical Artistry, 7930 Convoy Court San Diego, CA 92111. By appointment only 619.225.1915. © 2018 Adorations Botanical Artistry | All Rights Reserved.